Lead singer Ian Mc Culloch once proclaimed Ocean Rain as ‘the greatest album ever made’. While it doesn’t quite live up to that billing, it is certainly up there with the very best Post Punk albums of the 80s. The sweeping, romance of this epic showcased the Bunnymen at the height of their powers. Majestic. Released as a single in 1985, Bring on the Dancing Horses saw the Bunnymen team up with pop producer Laurie Latham in what was an obvious stab at chart success. The heavily produced sound incorporating drum machines and sequencers failed to mask one of the Bunnymens most elegiac, lovelorn songs. A shimmering beauty. With its Eastern influenced psychedelic intro, The Cutter announced Echo and the Bunnymen as one of British rock music’s brightest hopes. In Will Sergeant, the Bunnymen had the most inventive and exciting guitarist of his generation, alternating between slashing rhythm guitar and exotic, modal guitar solos that gave the Bunnymen their distinctive sound. This was the band at their most uplifting. The title track of their classic 1984 album is another string drenched epic. Mac gives one of his most commanding performances to close out this album on a beautifully melancholic note. If you were one of those privileged to see them perform this album in its entirety at the Olympia two years ago, this one might have brought a tear to the eye. The comeback song to beat all comeback songs. The first single released from their 1997 album Evergreen, this was a triumphant return for Ian McCulloch and Will Sergeant after seven years pursuing various solo projects. Featuring backing vocals from none other than Liam Gallagher, this was stirring, heartfelt stuff and saw the band reach number eight in the British charts. From their debut album Crocodiles, released in 1980, Rescue was the Bunnymen at their coolest. Bass player Les Pattison and drummer Pete De Freitas (tragically killed in a motorcycle accident in 1989) were the stars of the show on this one – the Bunnymen really knew how to groove and Rescue had the swagger and confidence of a band who knew they were just a little bit special. The title track from their second and probably least accessible album, Heaven Up Here is dark, frenetic and sounds just a little messed up. Sergeant’s guitar playing spins off on wild tangents with Mac sounding at his most primal. Dangerous, edgy and markedly different to anything on their debut or anything that was to come on subsequent releases. 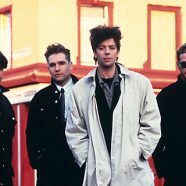 Under pressure from the record company to deliver a commercially successful album, the Bunnymen’s self titled fifth LP brought them to a whole new audience in the States but was undeniably their weakest effort to date. The production drained the music of all its edge, for a shinier, radio friendly version of the band. But in amongst some of the weakest tracks in their back catalogue, The Game shines, with all the elements that made the Bunnymen so special present and correct. Released as a single in 1983, Never Stop was as close as the Bunnymen ever came to making an out and out dance track sounding like a close twin of the kings of indie dance at the time, New Order. The 80s penchant for multiple 12” remixes was a lucrative way of selling the same thing in slightly different outfits – but the ‘Discotheque’ 12” remix of this track in unquestionably the definitive version. Recent Bunnymen material has been a little patchy if truth be told, but this title track from their 2009 album release, hints at the poise and grace of the Bunnymen of old. With a passing nod to Heroes by David Bowie, The Fountain shows that Ian McCulloch’s talent as a songwriter remains undimmed, and that maybe, just maybe, there is another ‘greatest album ever made’ in there somewhere.